The fine was levied: $103,000. $1,000 a day for 103 days in violation of the court order. The scene above can never be photographed again. It was heartbreaking to discover the habitat destruction on my first kayak outing this spring. Generations of Great Blue Herons had used that tree in all seasons – fishing in the waters below, sunning for warmth on autumn mornings, sleeping soundly on one leg. I’d been photographing them there for more than a decade. Each morning on the water, I would raise binoculars to scan that tree for a Heron, but not any longer. Training the binocs on that spot brings only sadness, not sightings of the Great Blues and Green Herons, Black Crowned Night Herons, and the Turtles often seen there. While Massachusetts owns the lake and its waters, there are some privately-held properties along areas of the shores. The owner of the property behind the beautiful partly submerged tree shown here illegally cleared land and removed trees after bulldozing the former home on the site. After clearing the land, he brought in an excavator and swept that beautiful tree and others from the water. Someone called the police who caught him red-handed, but it was too late to save that lovely corner of the cove. His plan? To construct three new homes for some international buyers – people with no great love for the lake, no appreciation and no respect for the wildlife that calls the cove their home. Last fall the court put him on notice that the fine for continuing to desecrate the area was $1,000 a day, but he persisted. This spring, he was assessed $103,000 for the violations, and a new fine of $25,000 a day was imposed for any continued damage. Shifting gears a bit, one day years ago, a bookcase at home was moved from a hallway to the living room. When I came home from work that night, Phoebe the calico cat greeted me at the door and immediately led me in the direction of where the bookcase had been. She sat there in that spot, as though pointing out to me that it was gone. Another time, a friend’s cat, Minnie, greeted me at their front door and purposely led me up the stairs to show me her new kittens, nestled in the bottom drawer of a bedroom dresser. So it was that a week ago, one of the Herons showed me that the tree was gone. That morning, the adult female Great Blue watched from her perch along the south bank as my kayak curved across the channel towards the tunnel. Suddenly, she swooped across my bow and headed towards where that tree had been. She landed on the shore at that very spot, and stood there staring at me. I have no doubt that she was showing me that her tree was gone… but she was still here. Thanks to Erica V and WordPress for this week’s WPC Challenge: Delta. The top “before’ and the bottom “after” photos are stark examples of the nature of change. From now through July 13th, I am a Featured Artist at the Five Crows Gallery in Natick, MA. Drop in and see the work of the many wonderfully creative artists who show there when you’re in the area. Five Crows is on FaceBook. To give the gallery a visit, please click here. From July 1 through July 30, 2016, I was the Featured Artist of the Month at the Summer Street Gallery. The Great Blue Heron photographs once again graced the walls of the lobby and theater in a one-woman show at The Center for Arts in Natick. In addition to the visual arts shown at the gallery, TCAN has a lively, dynamic lineup of upcoming performing artists. Share the love, but please respect the copyright. No reposting of any photos without permission. Posted on July 2, 2017, in ardea herodias, Art, Bird photography, DPchallenge, Great Blue Heron, Kayaking, Nature, Photography, Photography challenge, postaday, Weekly Photo Challenge, Wildlife Photography and tagged great blue heron, postaday. Bookmark the permalink. 30 Comments. How sad. It’s truly a shame that people don’t think of the repercussions their actions have. So sad about the destruction of the natural habitat. Some people just don’t seem to care, especially when there’s money involved. It is horrible the way some people cannot see beyond their profit target. But life and the herons go on, and we have the great pleasure of sharing in a little of this through you, Babsje. Thank you for watchful eye. You’re welcome. I hope someday that stuff like that is outlawed. These animals were here before us and I believe that it is wrong to take their land that they require to live. This is devastationg news and all for the sakw of money – greed. At least the Heron’s aresafe even their tree is not there. I am wordless. It seems one beautiful place after another disappears in the name of greed. Instead of endless wilderness, there is no more. But I am glad the herons are adapting and yes, I have had birds often show me what I or someone else has done. Thx for the update . . . a truly horrible story of greed. I do hope the fine is collected. Great photo of the herron.I love this birds to. It is very sad. Fines do not seem to bother those with enough money to throw away. They come in and destroy natures gifts without a thought to the lives of all those living and enjoying the area. Just because their money bought a temporary piece of property doesn’t mean they should come in and clearcut, ignore the laws, and destroy the land without any consideration of all those living in that community for decades before them. They forget that one day they too will die and their property will be bought by another or left for nature to once again thrive. It is the way in which they go about this. Generally I’ll notice a dirt trail into the woods and will remark that someone is clearcutting back there. People riding with me will think I’m ranting. Then within the year there is a paved road and houses in the back that are clearly seen once the remaining trees along the road are cut. I am seeing this happen in the Adirondacks – forever wild – that is what is in the law. Big money can come and take over anything – buy politicians and local board members with big promises that are never met. The other day on one of the dirt roads into the woods I witnessed a very large timber truck pulling out filled to the brim with logs heading north. From the road one would only notice the deeply entrenched tracks heading into the woods. With the pile on that truck we can only imagine the destruction hidden behind the wall of trees blocking the view behind them. Sorry for my rant but I’m feeling your pain! One thing to remember is nature always wins in the end. Those of us who love nature need to purchase large tracts of forest and hold them in trust for the future. Love and Light! Oh, bless! Nice to know you’re loved by that heron, Babs, but isn’t it wicked what people will do for profit? He obviously has more money than anything else. With fines like that and he continues to destroy the area, it’s nothing but selfishness. He obviously cares for nothing. So sad that the herons lost their corner of the cove but glad they’re still around. While Colorado has a closer “relationship” with developers, fortunately the permitting process slows things down a bit for a review on new development. A freeway expansion project was halted due to the presence of a small colony of a rare field mouse species some 20+ years ago. Though the mouse colony moved to another location on their own, that piece of land wanted for the expansion has become open space. The developer determined the land would needed too much backfill for road expansion or anything else. The company donated the land to Nature Conservancy. So, if the mouse colony moves back to their original field, there’d be no hassles. TCAN: Arts Center for the Next Generation has transformed the beautiful second level of their historic Firehouse into a new, intimate venue for concerts, movies, and other events, with an enhanced space for visual artists to display their works. For the months of May and June 2018, I am once again the featured artist at the Summer Street Gallery of TCAN in Natick, MA. A selection of my heron and flower photos is now available at the Five Crows Gallery in Natick, MA. Drop in and see the work of the many wonderfully creative artists who show there when you're in the area. He started it! No, she started it! 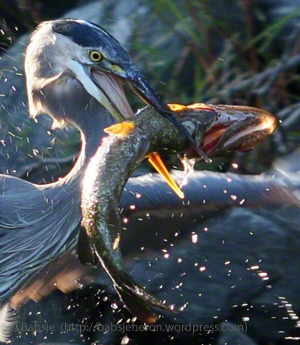 When is a Beautiful Great Blue Heron Most Like a Golden Retriever? Put a Beautiful Great Blue Heron on a Pedestal? Who, me? Great Blue Heron’s Artistic License? Who’s Afraid of the Big Bad Owl? Charles River Canoe & Kayak is on FaceBook. To give them a visit, please click here. Boating in Boston is on FaceBook. To give them a visit, please click here. © 2004-2017 Babsje. Unauthorized use and/or duplication of this material and/or photographs without express and written permission from this blog’s author and/or owner is strictly prohibited. Do not pin on Pinterest. Do not repost using Scoop.it. No derivatives. Please contact us for permission to quote excerpts from this blog. Brief excerpts and links may be used, provided that full and clear credit is given to Babsje and babsjeheron.wordpress.com with appropriate and specific direction to the original content.